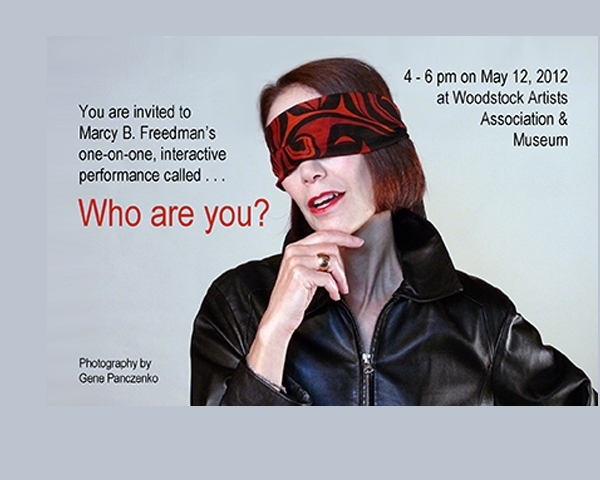 I was proud to learn that David Ross (former Director of Boston’s Institute of Contemporary Art, former Director of SF MoMA, former Director of the Whitney Museum of American Art) had accepted my proposal for this interactive performance to be presented at the Woodstock Artists Association and Museum. On the day of my performance, the crowd at the museum was comprised primarily of Woodstock locals, and the people who chose to participate in my project were well-suited to the task I presented. For two hours, I sat at a small table, blindfolded. When someone took the seat across from me, I explained that I could not see them and that I probably did not know them. And then, I asked them to answer this question: who are you? Most people took my question very seriously and shared surprisingly candid assessments of themselves. Many people thanked me warmly, stating that it felt good to talk openly about themselves. It was rewarding for me to listen to them!